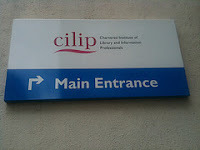 Last weekend I attended the CILIP East of England event 'Making CILIP Work for You' which was held in Cambridge. The afternoon featured talks on CILIP and social media by CILIP president Phil Bradley, feedback from the recent survey of CILIP East of England members and group discussions. After outlining the structure of CILIP and his duties as president, Phil went on to talk about new developments within CILIP. He highlighted the need to make CILIP seem like less of a London centric organisation, a decision which is reflected in the fact that this years AGM will be held in Newcastle. This is something I hadn't really considered before. I live in Cambridge so it isn't that much of a hassle for me to get down to CILIP HQ in London, but I do appreciate that this would be difficult for others who live further away. There was general acknowledgement from around the room that this was a positive step. The point was made that although at times CILIP is an organisation, it is made up of people and these people are the key to its success. The organisation is there to represent its members so it is vital for us to tell them how they could best do this. This is the aim of events such as this one and all members are encouraged to have their say. If people don't, then they can hardly complain that they aren't getting what they want! Events like this enable Phil to find out what members are doing in their libraries and then share this knowledge with other librarians who may find it useful, as well as putting it out into the wider world. The second part of Phil's talk focused on social media in libraries. Since this is my current research topic my ears pricked up! Phil made an excellent point which I've seen mentioned a lot on Twitter lately. He argued that although there is resistance in some places to social media use in the workplace, as information professionals we should be able to argue that social media IS an information resource and therefore it's part of our job to know about it. This really stuck a chord with me and is an argument that I intend to pursue in the future. In addition to this, using social media shows that the library is involved and proactive when it comes to their users. Social media is where users are so this is where the library should be to. If not, then we're missing out something huge! Phil is adamant that CILIP should be well represented on social media for these very reasons. His philosophy is "it's not a question of IF we get involved in social media but HOW we get involved" and he recommends that libraries think very carefully before deciding not to use it. Libraries have traditionally been the 'keepers' of information but we all know that this has changed. We still need to be the people that users come to for information and if social media is where the most useful information for their needs is then we need to know about it. Librarians and other information professionals need to aid users in finding quality content amongst the sheer amount of information available today. The goalposts haven't really changed, they have just moved a little bit to include new formats. With so much information present, someone needs to tell users which is the 'best' information to use - librarians. The main focus of the afternoon was small discussion groups which were held on various topics. I took part in the groups on advocacy and training. Live blogs from these groups and the others can be found on the CILIP East of England blog so I won't cover the same ground here. One issue that came up again and again in our advocacy group was the issue of volunteers in libraries and what is seen as the consequent 'de-skilling' of the profession. Whilst people praised the work that volunteers had contributed to libraries that they had worked in, there was a definite air of caution. This is something which seems to have been echoed on Twitter in recent days and I'll be interested to see what feedback comes from this. Another issue that was discussed was how CILIP could aid in small scale advocacy. The example used was social media and it was suggested that a sort of 'fact sheet' of reasons why libraries should be using it should be put together in order to aid individuals in putting their cases forward to their managers. This would be really useful and would certainly be applicable in many other similar situations. We then moved on to discussing training and there was a definite discrepancy in training budgets across the libraries represented. Some had the freedom to attend pretty much what they wanted whilst others had to fight to attend even one training course. Whilst CILIP can't do much about the policies of individual employers, the East of England group are intending to try to fill a little of the gap left by the closure of the official CILIP training programme. It was pointed out that just because the event is for East of England members, this doesn't mean that it has to be held here. If it easier for everyone to get to London then why not hold it there? Other points raised included the cost of training. There seemed to be equal numbers of people who would be happy to pay and those who wanted free training and events. I would personally be happy to pay an affordable amount for training and events, but I did raise the point that travel costs need to be taken into consideration when setting the budgets. Another topic discussed was the possibility of a virtual learning environment which is apparently something that CILIP are actively working on. I'll be interested to see what they come up with. Having an online learning environment would certainly solve the problem of securing time off work to attend training sessions! Overall it was a really interesting and stimulating day. I came away feeling positive and inspired about the profession in general and eagerly looking forward to the next CILIP East of England event. Thanks for posting this Claire, glad you enjoyed the day! Great to meet you on the day, Claire, and hear about your experiences! Really glad you found it all useful - I thought it was one of the most useful events I've been to for a while. Thanks for the comments. It was really nice to meet everyone and I really enjoyed the day. Hope other people got as much out of it as I did.